There is something that is just so completely magical about New York rooftops. This particular spot was in the East Village, an area that is free of skyscrapers, so relaxing on an apartment rooftop is quite freeing. Comparable to standing in an open field, except surrounded by sky rather than land. Such a wonderful feeling! Anyways, this outfit was worn on one of those freezing cold spring days which we have had every now and then. I can't complain though, I always seem to find comfort in gloomy days. Anyways I hope you all have a lovely Monday! Bonnie, I love this pleated dress! what a pretty color on you! I love love love this pleated dress! The pretty peach colour is gorgeous too! that's a very pretty dress and i adore that jacket! I really like the combination of style! Dress and jacket, all perfectly! Really love your blog ! your outfits are always so beautiful in NYC ! The color of your dress is really lovely on you. I like your bag a lot too. You look great and I love going on rooftops! Looks like a lovely place to hang out in the summer... Love your outfit! love the color of that dress and the pleats! goes perfectly with the leather jacket! So cute! I love the pleating of the dress, and your SM booties! That's such a pretty dress; the pleated skirt is divine! I'm always had a fascination with NY rooftops as well, I see them in sitcoms like Friends etc. and have always wondered what it would be like to just sit there for hours at night, looking at the sky. 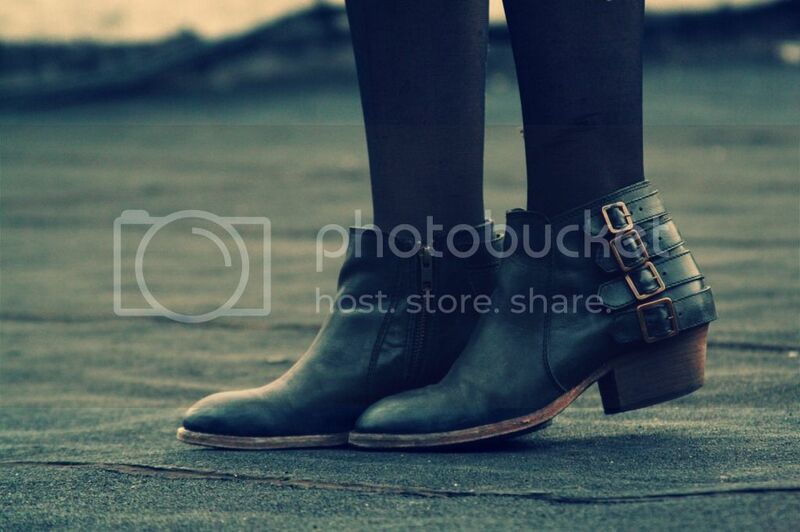 Oh my gosh, I love the boots! A rooftop without any sky scrapers does seems very freeing indeed. Gorgeous dress, I have a similar one from Topshop in a deeper shade. Very nice look. I love the peach color of the dress on you, Bonnie! Great look! Your dress is adorable! I like when the weather is overcast and gloomy, however I hate it when it is rainy. I have to say that that dress is very pretty on you, that particular shade of peach is very becoming on you. I especially like that you added the leather jacket to give it a more casual look. Love the pleats and the combo of the boots make the outfit look even more awesome! Such a cute look, I adore pink pleating & motor jacket, perfect combination. You can always get really amazing shots on a NYC rooftop no matter what the background is. The pink is so feminine and refreshing, while the leather jacket and boots make your outfit edgy and unique. Lovely! Love how you balanced out the preciousness of the pleats with the the funk of the leather jacket and purse and boots - perfection! Your dress is perfection, the pleats and colour are just adorable and I love your boots, too. Another perfect outfit. Love this look! ohhhh i like so much these booties!! !i love the dress too. gorgeous dress bonnie! the colour is lovely. I love the pleated dress! 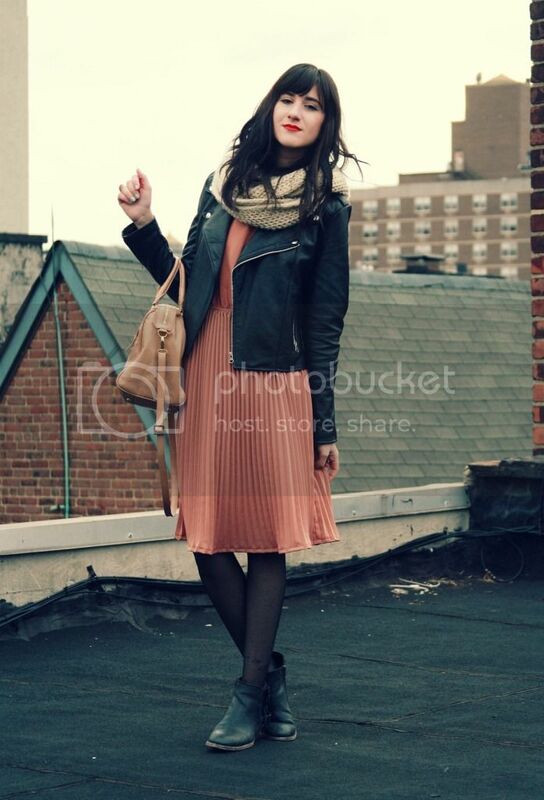 I have a thing for rooftops as well ;) You look stunning with the pleats! beautiful outfit, looking snug n warm! Ohh you're making me want to go back to New York. Thought I'd let you know that you remind me a lot of a singer named Alex Winston. You should check her out! pretty awesome stuff! Fun look! Love your pleated dress! wowwwww. the photos and outfit are so my thing. i absolutely want that dress and jacket combo so bad, it's so effortlessly gorgeous. I've only shot on a rooftop once and it was really so cool. These shots are pretty. Love the leather jacket and the peach colored dress. Lovely outfit! I like your blog and your style! LOVE this outfit! Pleated skirts are my fav now. What an awesome place to take pics...love the pleated skirt! Such a cute outift! Love the blush pleated dress!!! Thanks for stopping by my blog and your comment! Hope you'll visit again sometime soon! thanks for your nice comment, I'm glad to know your blog! have a great style all her outfits are very inspiring! your look is divine I love the folds .. I follow you! Can you tell us where that jacket is from please? The perfect balance between feminine and masculine look! Love it! That dress is so cute! Love the color.